This weekend I scaled a 40-meter wall of ice with 8 knives attached to each foot and an ice axe in each hand, got smashed in the face by a brick of ice in -20C weather, and loved every second of it. 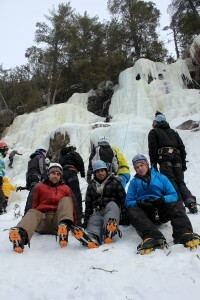 I was one of 22 wonderful participants to go on the McGill Outdoor Club’s intro to ice climbing trip. For McGill students who are at all outdoorsly inclined (I don’t care if that’s not a word – I just added it to spellcheck so bam! ), the MOC is seriously worth looking into. The club (whose website is here) is one of Canada’s oldest and most respected student-run outdoors groups, and they host events almost every weekend ranging from hiking, camping and canoeing to rock climbing and basically any other outdoors pursuit you can imagine. 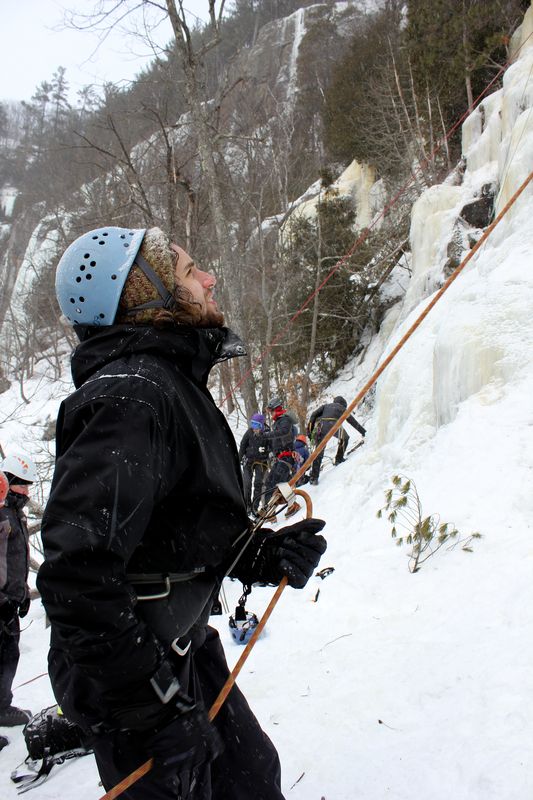 On this trip, known affectionately as ‘ice-school’ by the veteran MOC members, a small group of students have their first crack at a sport that basically involves attaching lethal weapons to every limb and chipping your way up a frozen waterfall. On Friday night we headed to the MOC house in Prevost, Quebec. Although it’s only 45 minutes away from downtown Montreal, the clubhouse has all the makings of a classic naturephile’s getaway: a big fireplace, loads of bunk beds, and proximity to lakes, hiking, snowshoeing and skiing trails, and of course, icy cliffs. Saturday morning we were up at first light to pack lunches and hit the trails. After a half-hour hike in the woods I was nearing a state that could be considered ‘awake’. The waking process was accelerated by the fact that it was so cold people’s hair and eyelashes were white with hoary frost. Nearing the cliff, we paused in a small clearing to put on our helmets and crampons. If you’ve never worn crampons before, the experience is similar to having razor-sharp blades on every inch of the sole of your foot, which is not that surprising since you have razor-sharp blades attached to every inch of the sole of your foot. Suddenly the whole world seems soft and you’re an oaf surrounded by things that don’t like to be stepped on, such as your belongings, lunch, parts of other human beings, and the ropes you will soon be dangling on. My snowpants, on the other hand, adored the crampons, as the dozen holes in them can attest. On the first day we spent 8 hours at our base on a snowy ledge climbing, belaying (a fancy term for ‘holding the other end of the rope’) and getting comfortable with the gear. There’s a significant amount of technique to learn to avoid just hacking aimlessly at the ice and exhausting yourself. The trick with using crampons on the vertical plane is to give a significant football kick to sink in the front spikes, then to trustingly push your heel down into empty space to engage the next set of teeth. The axes can be surprisingly delicate and precise; you can gain purchase with only a few millimeters in the ice. 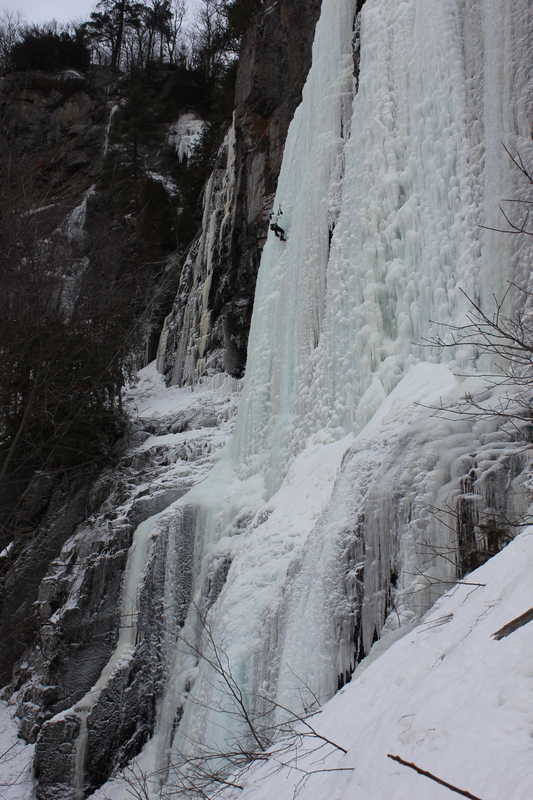 Your entire body is suspended by a handful of centimeter-thick spikes penetrating the ice. There is also sometimes hot chocolate. On the second day we were back at it, but this time everyone struggled to rise after the previous night’s festivities. I would most accurately describe how I felt personally as ‘like crap’. I ate my pancakes in the corner like a sulking hermit. As soon as we were back in the woods my mood fully reversed course. 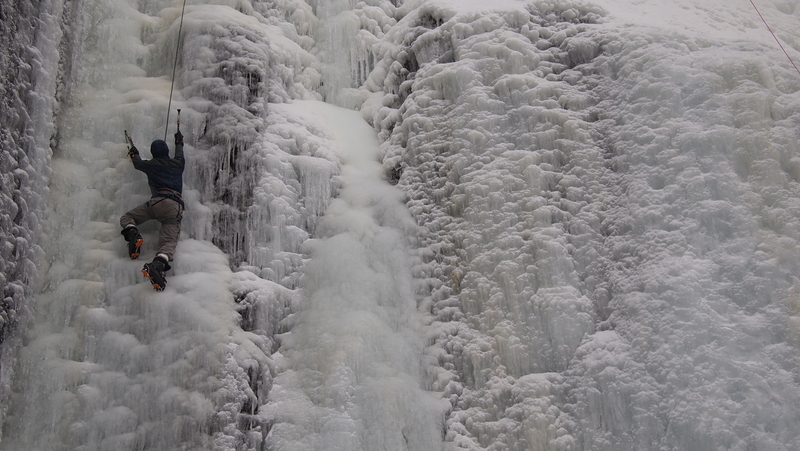 Today we had the option of tackling the longer route; a 40m frozen waterfall. I was pumped enough about this prospect to irritate 2/3 of the group by talking incessantly about it as we hiked in. 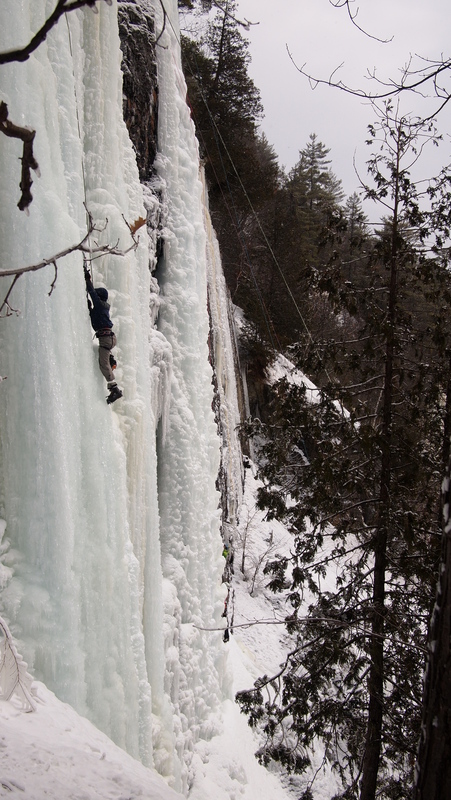 Sunday was warmer than the previous day, and by the time we got onto the wall there was a steady drip of water at the base. As I inched up, first one axe, then the next, one crampon, then the next, the trickle on the surface of the towering face became a running stream. My gloves instantly filled with freezing water. Drops cascaded off my helmet, across my face and down my jacket. Halfway up I had to pause to take my sunglasses off; a layer of ice had formed on them so thick that they were almost opaque. They proved to be hard to remove, as my gloves had also frozen solid to the axe handles. At 30m my hands were a combination of numb with cold and hot with cramps, and by the time I reached the top my entire suit was covered in a crust of ice. My snowpants crunched like stiff cardboard. As I was lowered back to earth I looked out over the valley and frozen lake below, my breath steaming out into the void. It was a rush! One by one, the group scaled our routes. By the end of the day everyone had tested their limits; for newcomers it was the limits of our abilities and for the guides it was likely the limits of their patience. I cannot overstate the difficulties involved with organizing the gear, people and transport of such a trip, nevermind teaching, assisting and supervising all weekend. We had 6 great guides with us that kept the weekend safe as can be, and we owe them all a huge thanks for their efforts. If you have a chance this winter I highly recommend giving ice climbing a shot! Having a bit of rock climbing experience is helpful, but there were complete climbing newbs in our group who had never been on a vertical wall before and did fantastically well, completing some challenging sequences by the end of the trip. So go join the MOC and do something new! There’s no cheaper way get out there, and the company is great. As for the brick of ice in the face alluded to at the beginning of the story: listen to your instructors. If you swing ice axes into giant icicles and proceed to try to hang on them, the chances of getting a block in the face increase drastically. Think before you swing! Published by erik on 2013/02/05 at 12:59 AM under General Discussions, Grad school experience.